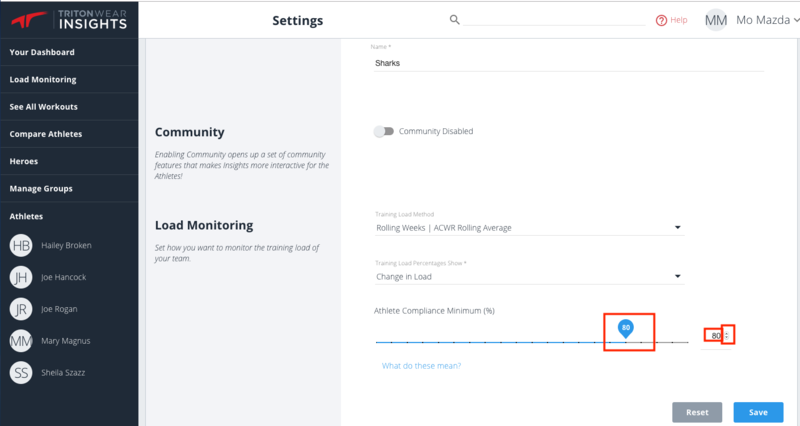 What is Athlete Compliance Minimum, and why should i customize it? The Athlete Compliance Minimum represents the minimum percentage of practices for which an athlete must provide an RPE during the last month, before TritonWear can step in to estimate a missing value. Why customize Athlete Compliance Minimum? If an athlete does not enter an RPE for a practice, TritonWear uses an estimated number based on historical data. The default setting of 75% means that if an athlete enters their RPE for 3 out of 4 workouts in a week, the 4th can be estimated so that training load and injury risk can be calculated. If athletes are regularly non-compliant and have too many missing values, you can set a lower compliance minimum in order to see an estimate of their training load and injury risk. However, note that setting this too low (<50%) risks inaccurate feedback, as most RPE values will be based on estimates, not real data.